NAMM is the greatest place to showcase new products, concepts and ideas in the guitar world. Every January, representatives from the entire musical instrument industry flock to Anaheim to escape the cold Winter, err, we mean to display and sell their newest and most brilliant creations. Taylor’s big news this year is the unveiling of a brand-new body shape. Dubbed the Grand Pacific, this new shape aims to improve on the Century-old Dreadnought shape used by virtually all guitar makers. The Grand Pacific shape is the creation of Taylor’s master luthier Andy Powers. Powers approached this project through his love of Bluegrass music. He wanted to hear a Dreadnought-style guitar without some of the age-old problems inherent in the design. Resolving to experiment, Powers re-drew the dreadnought’s outline and added his award-winning V-Class bracing to the design. 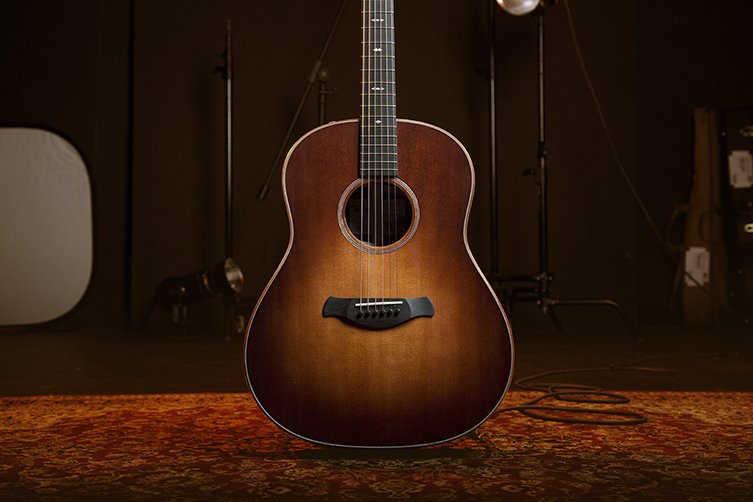 The V-Class bracing helps the guitar project more, sustain for longer and, in Taylor’s own words, improves intonation “by putting the guitar top more in tune with the strings”. The Grand Pacific is the result of this long period of experimentation. The shape is similar to a round-shouldered dreadnought but with its own silhouette and character. There’s more though: this design addresses the low-end muddiness that has plagues dreadnought models for a hundred years! 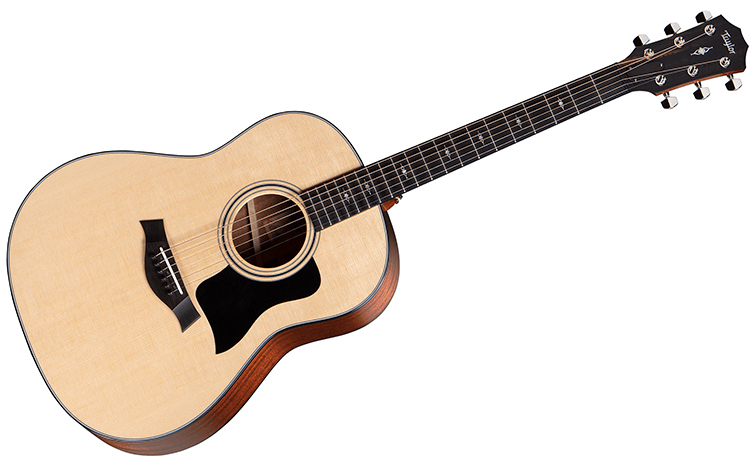 The Taylor Grand Pacific design still has a strong low-end, but it is more ‘trim’ than overpowering. It keeps clarity. This is true across the whole spectrum: there is a consistency from low frequencies through the mids and into the high frequencies. Every strum and note produces a clear, balanced sound. Speaking of the sound, the overall tonality is something of a departure for Taylor. The bright, contemporary tone associated with this brand is not really what you get here: the Grand Pacific design really warms things up and gives you a tone that’s rounded, full of notes that gel beautifully together. Taylor want this guitar design to be seem as a real workhorse and have worked hard to make this shape appeal to strummers, fingerpickers, flatpickers and songer-songwriters alike. The Taylor Grand Pacific is represented in the line by the ‘17’ designation. Revealed at NAMM were a tight but impressive selection of ’17’ models. The 317 is available with a Sitka Spruce top, Sapele back and sides and will be available from us with and without Taylor’s world class Expression 2 pickup system. The 517 and 717 models belong in the Builder’s Edition run of instruments and, correspondingly, share some fantastic features. The body’s edges are chamfered for comfort, similar to the fingerboard’s rolled edges. 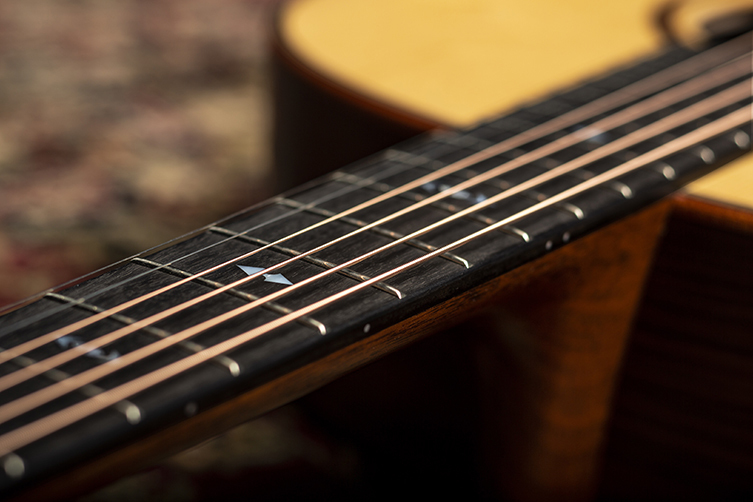 Even the bridge is considered: the shape is a curved wing style that’s designed to feel great under the picking hand. Little details are things that Taylor are great at considering. The tops on these Builder’s Edition guitars are torrefied. For those who have heard this term but aren’t sure what it means, ‘torrefaction’ or ‘thermal aging’ is a process whereby the timber is subjected to extreme heat (not fire) which not only takes away all moisture but also encourages the molecular makeup of the wood to alter permanently. In effect, it makes the wood sound and behave like timber that’s many decades (even a century or more) old. The sound is louder, more defined and more strident. The 517 and 717 models have this great addition, which adds to the sound immeasurably. Each of these guitars is available in two finishes: Natural and a new finish, Wild Honey Burst. They both look sublime and are available for pre-order from us with the Expression System 2 installed. 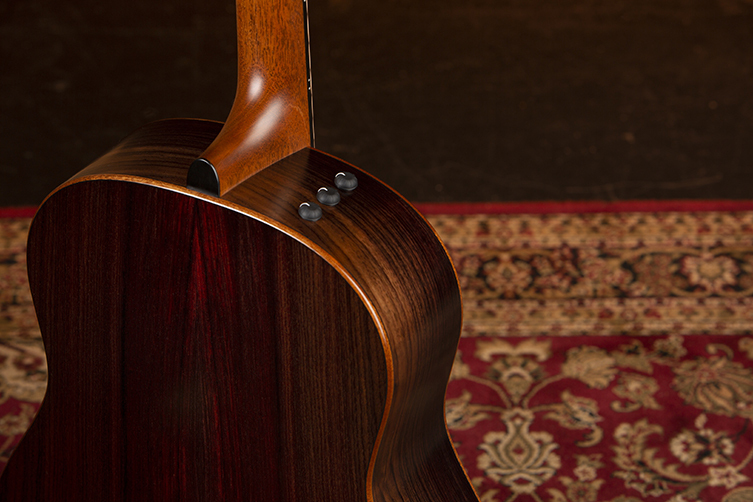 The 517 features a Mahogany back & sides, whilst the 717 has Indian Rosewood. Ever the innovators, Taylor bring something new and exciting to the table of every guitarist this year.